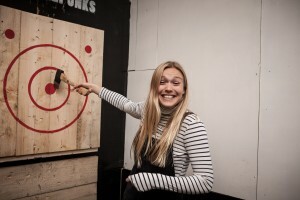 What is Urban Axe Throwing? Apparently it's the most satisfying and social day or night out you'll ever have! You’ll be slinging axes side by side against your friends or family, hitting bullseyes and cheering on your mates. All backed up with great music and atmosphere and a chance to socialise between throws. We have one group voucher (max 4 people) to give away each month, for use in your preferred location: London Vauxhall, Birmingham or Manchester. NB. 18's and over please.